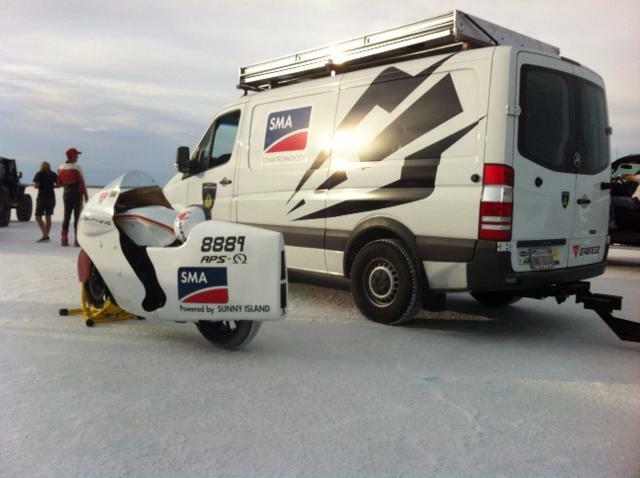 KillaCycle Racing wasn't the only electric motorcycle team at Bonneville this week. Lightning Motorcycles was there too, but they didn't post as much on Facebook and I haven't had a chance to talk with them. On Aug 26 they posted: "We're super excited to say that today, on the legendary Bonneville salt flats, we've claimed the first SOLAR land speed record! Hearty shout-out to SMA America for all the support, and more to come soon!" What this shows is their race bike, but with the land speed record fairing. They've experimented with several fairings over the years and the idea is to cut wind resistance. Notice how this one has a leg shaped cut-out that's obviously so the rider can easily mount and dismount the bike as needed. The solar panels are shown deployed in the first picture, and folded up in the second. They're mounted in aluminum frames on top of the Sprinter van, that have gas struts to hold the panels in place. 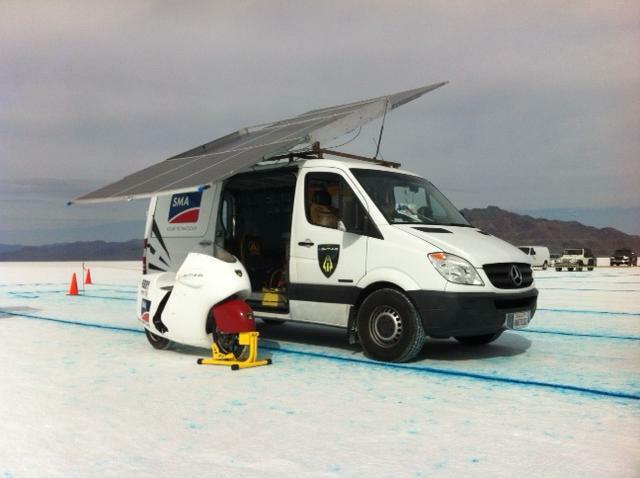 When parked somewhere they deploy the panels, which then charge a 35 kilowatt-hour battery pack mounted inside the van. Also in the van is a pair of 6 kilowatt SMA inverters. The inverters are powerful enough to run high end Manzanita chargers letting them quick charge the bikes in under an hour. Plus it powers all the tools they need on-site. They didn't post any specifics about speeds etc. I don't know what they mean by "solar land speed record" as I doubt the event organizers care about the source of the electrons that powered the bike. The land speed record for this sort of bike is held by Lightning Motorcycles - 215 miles/hr in 2011. Lightning did post this nice picture of conditions after the rain storm that canceled racing for the week. Whatever they could have achieved this week got cut short by the rain storm.